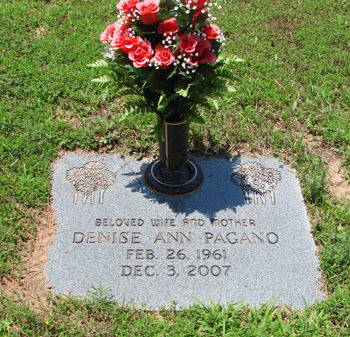 Denise Ann Pagano, daughter of Sharon DeSerio, wife of Paul Pagano. Denise Ann Pagano, 46, of Canton died Monday, Dec. 3, 2007. Services will be at 2 p.m. Saturday at Huey Funeral Home in Canton, with the Rev. Billy Edmonson officiating. Survivors include her husband, Paul Pagano; one son, Damon Pagano of Canton; one daughter, Tia Pagano of Canton; her mother, Sharon DeSerio; and one brother, Guy James DeSerio of Rockton, Ill.